Our clamp-on type ultrasonic flowmeter UL320 is "time-flight type" flowmeter and capable of measuring a flow rate of metallic and plastic piping ranging from 25 to 1,000 mm in nominal diameter. The ultrasonic sensor is mounted to the exterior of an existing piping by clamping method so that it will not come into contact with the measuring fluid at all. It is capable of measuring a flow rate without considering corrosion of the sensor due to a corrosive fluid, particle/metallic ion contamination by the moving part of the floemeter, and pressure loss. Comebines use of a DSP and an AD converter speeds up flow rate measurement (higher-speed zero-cross measurement)to improve bubble resistance and provide high-accuracy measurement in small flow rate. A complete non-contact measuring method perfectly prevents generation of particles and mixture of metallic ion. Installation of the flowmeter does not cause pressur loss because the sensor has no obstacles in the measuring pipe. 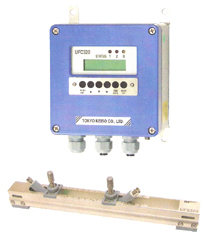 The ulrtrasonic flowmeter is not affected by the pressure or conductivity of a fluid. superior long-term stability bcause there are no moving parts. Standard functions include forward/backward flow rate display, totalizing display, analog output, pulse output, status output(various alarms: selective), and flow direction output. Capable of controlling a flow rate with digital data by adding an optional function, RS-485 serial output. (foward/backward flow rate output , totalizing output, and status output by the Modbus protocol) A multi-drop connecting method greatly reduces signal wires.